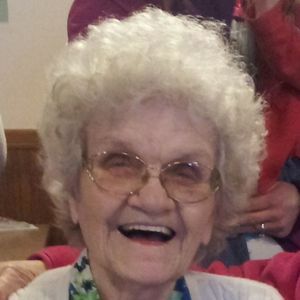 BEAVER DAM - Tyldesley Lee "Mammie" Buchanan, 91, of Beaver Dam, died Thursday, September 24, 2015, at 6:00PM at her home. Mrs. Buchanan was born March 20, 1924, in Muhlenberg County. She was a homemaker and member of New Hope Baptist Church in Logan County. She was preceded in death by her father, Elza Harper; mother Leavie Harper; husband Joe Buchanan; son William Buchanan; and ten brothers and sisters. She is survived by her children, Joseph (Susie) Buchanan of Equality, AL, David (Sandy) Buchanan of Beaver Dam, Glenna Buchanan of Belton, Phillip Buchanan of Alabama, Kevin Buchanan of Morgantown, and Edna (Tony) Henderson of Rochester; 20 grandchildren; 36 great-grandchildren; 13 great-great-grandchildren; and brother James (Sharon) Harper of Sellersburg, IN. Funeral services will be Sunday, September 27, 2015, at 2:00PM at Tucker Funeral Home in Central City, with Bro. Steve Moore officiating. Burial in Fairmount Cemetery. Visitation will be Saturday after 5:00PM at the funeral home. Online condolences may be made at www.tuckerfuneralhomes.com. The beautiful and interactive Eternal Tribute tells Tyldesley's life story the way it deserves to be told in words, pictures and video. Buck, so sorry about your mother. You done really good taking care of her. She couldn't ask for a better Son then you area. If you ever need anything just let us know.